The Airbus A380 glass cockpit featuring "pull out keyboards and two wide computer screens on the sides for pilots"
A glass cockpit is an aircraft cockpit that features electronic (digital) flight instrument displays, typically large LCD screens, rather than the traditional style of analog dials and gauges. While a traditional cockpit (nicknamed a "steam cockpit" within aviation circles) relies on numerous mechanical gauges to display information, a glass cockpit uses several displays driven by flight management systems, that can be adjusted (multi-function display) to display flight information as needed. This simplifies aircraft operation and navigation and allows pilots to focus only on the most pertinent information. They are also popular with airline companies as they usually eliminate the need for a flight engineer, saving costs. In recent years the technology has also become widely available in small aircraft. As aircraft displays have modernized, the sensors that feed them have modernized as well. Traditional gyroscopic flight instruments have been replaced by electronic attitude and heading reference systems (AHRS) and air data computers (ADCs), improving reliability and reducing cost and maintenance. GPS receivers are usually integrated into glass cockpits. Early glass cockpits, found in the McDonnell Douglas MD-80/90, Boeing 737 Classic, 757 and 767-200/-300, ATR 42, ATR 72 and in the Airbus A300-600 and A310, used Electronic Flight Instrument Systems (EFIS) to display attitude and navigational information only, with traditional mechanical gauges retained for airspeed, altitude, vertical speed, and engine performance. Later glass cockpits, found in the Boeing 737NG, 747-400, 767-400, 777, A320 and later Airbuses, Ilyushin Il-96 and Tupolev Tu-204 have completely replaced the mechanical gauges and warning lights in previous generations of aircraft. While glass cockpit-equipped aircraft throughout the late 20th century still retained analog altimeters, attitude, and airspeed indicators as standby instruments in case the EFIS displays failed, more modern aircraft have been increasingly been using digital standby instruments as well, such as the integrated standby instrument system. Glass cockpits originated in military aircraft in the late 1960s and early 1970s; an early example is the Mark II avionics of the F-111D (first ordered in 1967, delivered from 1970–73), which featured a multi-function display. Prior to the 1970s, air transport operations were not considered sufficiently demanding to require advanced equipment like electronic flight displays. Also, computer technology was not at a level where sufficiently light and powerful circuits were available. The increasing complexity of transport aircraft, the advent of digital systems and the growing air traffic congestion around airports began to change that. The Boeing 2707 was one of the earliest commercial aircraft designed with a glass cockpit. Most cockpit instruments were still analog, but CRT displays were to be used for the Attitude indicator and HSI. However, the 2707 was cancelled in 1971 after insurmountable technical difficulties and ultimately the end of project funding by the US government. The average transport aircraft in the mid-1970s had more than one hundred cockpit instruments and controls, and the primary flight instruments were already crowded with indicators, crossbars, and symbols, and the growing number of cockpit elements were competing for cockpit space and pilot attention. As a result, NASA conducted research on displays that could process the raw aircraft system and flight data into an integrated, easily understood picture of the flight situation, culminating in a series of flights demonstrating a full glass cockpit system. The success of the NASA-led glass cockpit work is reflected in the total acceptance of electronic flight displays beginning with the introduction of the MD-80 in 1979. Airlines and their passengers alike have benefited. The safety and efficiency of flights have been increased with improved pilot understanding of the aircraft's situation relative to its environment (or "situational awareness"). By the end of the 1990s, liquid-crystal display (LCD) panels were increasingly favored among aircraft manufacturers because of their efficiency, reliability and legibility. Earlier LCD panels suffered from poor legibility at some viewing angles and poor response times, making them unsuitable for aviation. Modern aircraft such as the Boeing 737 Next Generation, 777, 717, 747-400ER, 747-8F 767-400ER, 747-8, and 787, Airbus A320 family (later versions), A330 (later versions), A340-500/600, A340-300 (later versions), A380 and A350 are fitted with glass cockpits consisting of LCD units. The glass cockpit has become standard equipment in airliners, business jets, and military aircraft. It was fitted into NASA's Space Shuttle orbiters Atlantis, Columbia, Discovery, and Endeavour, and the current Russian Soyuz TMA model spacecraft that was launched in 2002. By the end of the century glass cockpits began appearing in general aviation aircraft as well. In 2003, Cirrus Design's SR20 and SR22 became the first light aircraft equipped with glass cockpits, which they made standard on all Cirrus aircraft. By 2005, even basic trainers like the Piper Cherokee and Cessna 172 were shipping with glass cockpits as options (which nearly all customers chose), as well as many modern aircraft such as the Diamond DA42 twin-engine travel and training aircraft. The Lockheed Martin F-35 Lightning II features a "panoramic cockpit display" touchscreen that replaces most of the switches and toggles found in an aircraft cockpit. The civilian Cirrus Vision SF50 now has the same, which they call a "Perspective Touch" glass cockpit. Unlike the previous era of glass cockpits—where designers merely copied the look and feel of conventional electromechanical instruments onto cathode ray tubes—the new displays represent a true departure. They look and behave very similarly to other computers, with windows and data that can be manipulated with point-and-click devices. They also add terrain, approach charts, weather, vertical displays, and 3D navigation images. The improved concepts enable aircraft makers to customize cockpits to a greater degree than previously. All of the manufacturers involved have chosen to do so in one way or another—such as using a trackball, thumb pad or joystick as a pilot-input device in a computer-style environment. Many of the modifications offered by the aircraft manufacturers improve situational awareness and customize the human-machine interface to increase safety. Modern glass cockpits might include Synthetic Vision (SVS) or Enhanced Vision systems (EVS). Synthetic Vision systems display a realistic 3D depiction of the outside world (similar to a flight simulator), based on a database of terrain and geophysical features in conjunction with the attitude and position information gathered from the aircraft navigational systems. Enhanced Vision systems add real-time information from external sensors, such as an infrared camera. All new airliners such as the Airbus A380, Boeing 787 and private jets such as Bombardier Global Express and Learjet use glass cockpits. Garmin G1000 displays in a Cessna 182. Note the three analog standby instruments near the bottom of the main instrument panel. Many modern general aviation aircraft are available with glass cockpits. Systems such as the Garmin G1000 are now available on many new GA aircraft, including the classic Cessna 172. Many small aircraft can also be modified post-production to replace analogue instruments. Glass cockpits are also popular as a retrofit for older private jets and turboprops such as Dassault Falcons, Raytheon Hawkers, Bombardier Challengers, Cessna Citations, Gulfstreams, King Airs, Learjets, Astras, and many others. Aviation service companies work closely with equipment manufacturers to address the needs of the owners of these aircraft. Today, smartphones and tablets use mini-applications, or "apps," to remotely control complex devices, by WiFi radio interface. They demonstrate how the "glass cockpit" idea is being applied to consumer devices. Applications include toy-grade UAVs which use the display and touch screen of a tablet or smartphone to employ every aspect of the "glass cockpit" for instrument display, and fly-by-wire for aircraft control. The glass cockpit idea made news in 1980s trade magazines, like Aviation Week & Space Technology, when NASA announced that it would be replacing most of the electro-mechanical flight instruments in the space shuttles with glass cockpit components. The articles mentioned how glass cockpit components had the added benefit of being a few hundred pounds lighter than the original flight instruments and support systems used in the space shuttles. The Space Shuttle Atlantis was the first orbiter to be retrofitted with a glass cockpit in 2000 with the launch of STS-101. Columbia was the second orbiter with a glass cockpit on STS-109 in 2002, followed by Discovery in 2005 with STS-114, and Endeavour in 2007 with STS-118. As aircraft operation depends on glass cockpit systems, flight crews must be trained to deal with possible failures. The Airbus A320 family has seen fifty incidents where several flight displays were lost. On 25 January 2008 United Airlines Flight 731 experienced a serious glass-cockpit blackout, losing half of the Electronic Centralised Aircraft Monitor (ECAM) displays as well as all radios, transponders, Traffic Collision Avoidance System (TCAS), and attitude indicators. The pilots were able to land at Newark Airport without radio contact in good weather and daylight conditions. Airbus has offered an optional fix, which the US NTSB has suggested to the US FAA as mandatory, but the FAA has yet to make it a requirement. A preliminary NTSB factsheet is available. Due to the possibility of a blackout, glass cockpit aircraft also have an integrated standby instrument system that includes (at a minimum) an artificial horizon, altimeter and airspeed indicator. It is electronically separate from the main instruments and can run for several hours on a backup battery. Training is clearly one of the key components to reducing the accident rate of light planes equipped with glass cockpits, and this study clearly demonstrates the life and death importance of appropriate training on these complex systems... While the technological innovations and flight management tools that glass cockpit equipped airplanes bring to the general aviation community should reduce the number of fatal accidents, we have not—unfortunately—seen that happen. ^ Chui, Sam. "A380 Australia visit November 2005". Samchuiphotos.com. Retrieved 2009-08-12. ^ Wallace, Lane. "Airborne Trailblazer: Two Decades with NASA Langley's 737 Flying Laboratory". NASA. Retrieved 2012-04-22. Prior to the 1970s, air transport operations were not considered sufficiently demanding to require advanced equipment like electronic flight displays. The increasing complexity of transport aircraft, the advent of digital systems and the growing air traffic congestion around airports began to change that, however. 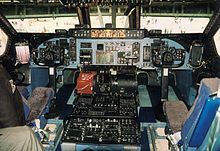 She added that the average transport aircraft in the mid-1970s had more than 100 cockpit instruments and controls, and the primary flight instruments were already crowded with indicators, crossbars, and symbols. In other words, the growing number of cockpit elements were competing for cockpit space and pilot attention. ^ "A320 flight deck". airbus.com. Archived from the original on August 22, 2008. Retrieved 2009-08-12. ^ a b Katz, Peter. "Plane & Pilot Magazine - Glass-Cockpit Blackout". Planeandpilotmag.com. Retrieved 2009-08-12. ^ "Blackouts In The Cockpit". Archived from the original on August 17, 2008. Retrieved August 30, 2016. ^ "DCA08IA033" (PDF). Ntsb.gov. 2008-01-25. Retrieved 2009-08-12. ^ SB-10-07, NTSB Press release, "NTSB study shows introduction of 'glass cockpits' in general aviation airplanes has not led to expected safety improvements"
Fred George (Mar 23, 2017). "Less Is More: Merit In Cockpit Minimalism". Business & Commercial Aviation. Aviation Week Network. 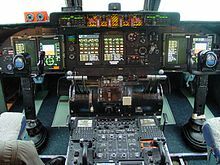 Wikimedia Commons has media related to Glass cockpits. This page was last edited on 10 April 2019, at 02:04 (UTC).